Oaklandsocialist thanks the National Security Agency (NSA) for their extensive news reporting service, otherwise known as eavesdropping. As Edward Snowden has revealed, the NSA listens in to almost all phone conversations. We recently were able to overhear one such conversation, which evidently took place a month or so ago but which we’re just now overhearing. The conversation took place here in Oakland. Kitty: Hey, Asher, this is Kitty. Asher: Kitty! What’s up? What you doing today? K: Not much. Hey, a few of us are going down to the Lake* to hang out. You want to join us? A: I think I’ll pass. You know, I just don’t feel comfortable down there. I moved over here from SF to get away from the crowds and to get a cheaper rent. And the Lake is, or could be really nice, but… well… you know…. A: Well, you know…. Ummmm, well, it’s just not comfortable down there. The vibe isn’t right. I don’t want to sound racist, but, well, you know…. K: Asher, you’re talking with me. You can say it. A: Okay. Well…. You know, it’s too many like they say ‘people of color” around the lake. A few is okay. In fact, I would like that. But, like, when I walk around there now, well, I feel almost out of place, like this isn’t my city anymore. K: Yeah. I know what you mean. I just moved here a few months ago, but you have been here a whole year now. You’re registered to vote here. You’re even on first name basis with your city council member. You live right across from the Lake. And these people are taking the Lake over. I bet most of them don’t live anywhere near the lake. Probably live a mile or more away! Why can’t they stick to their own neighborhood. We didn’t move here for nothing, did we? A: That’s exactly my point. With the rent that I’m paying — that we’re all paying — how could those people afford to live near the Lake? But I’m not taking this lying down. You know, I got hooked up with Libby. (Note: this is clearly a reference to Oakland mayor Libby Schaaf.) She told me that my landlord has already talked with her, but she said what she needs is some citizens’ complaints about the noise. And now, since she’s got that from me, we’re going to get Parks and Rec to crack down. Hey, we’re not paying $3,000 a month for nothing, right? K: Asher, you’re so right. You know, I believe in being civically active. A: Okay. Catch you later. I’m just going to hang out with Buddy today. K: Ohmigawd! how is that cute little bulldog doing? A: Doing fine. Speaking of ‘doing fine’, I got to brag: My trust fund is breaking records, thanks to that suggestion you made. K: Really? I’m so glad. Maybe I should go into financial advising! A: (laughs) Yeah, but that’s a lot of work. K: True. We wouldn’t want work to get in the way… Hey, my buds are here. Let’s meet up one of these days. 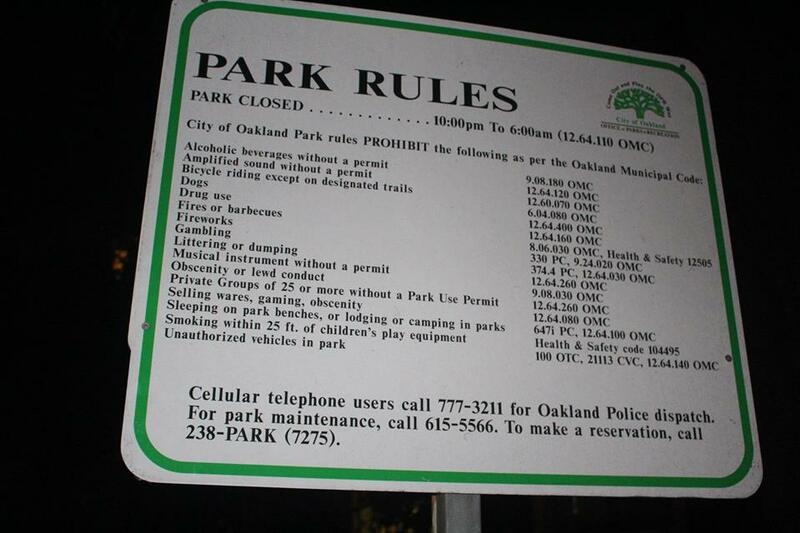 Recently, following a dispute over drumming in the park, the city Parks and Recreation department posted new signs with what is allowed and prohibited around Lake Merritt. Signs recently posted around Lake Merritt. Note the claimed prohibition of playing a musical instrument without a permit. As you can see from photo, the signs claim that playing musical instruments requires a permit. However, according to the municipal code cited, this is only true if sound amplification is used. These signs posted by the City are telling an outright lie. Sustainable Buildings Systems, Cedar properties, R.E. Steele Properties, Mason McDuffie. 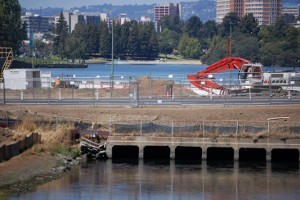 Recent Lake Merritt renovation project. Oakland residents spent about $200 million for this project – to the benefit of the real estate speculators. Other donations of interest include major donations from the CEO of Ballena Technologies. Ballena describes itself as “the market leader in sports and entertainment venue visualization”and they are involved in technology for sports arenas (Oakland Coliseum, anybody?). Schaaf has also received major donations from various companies in the health care industry such as NVIGANT and Dignity Health. Another interesting donation is from EJP corporation. From their web site, it appears they would be involved in privatizing the water industry. 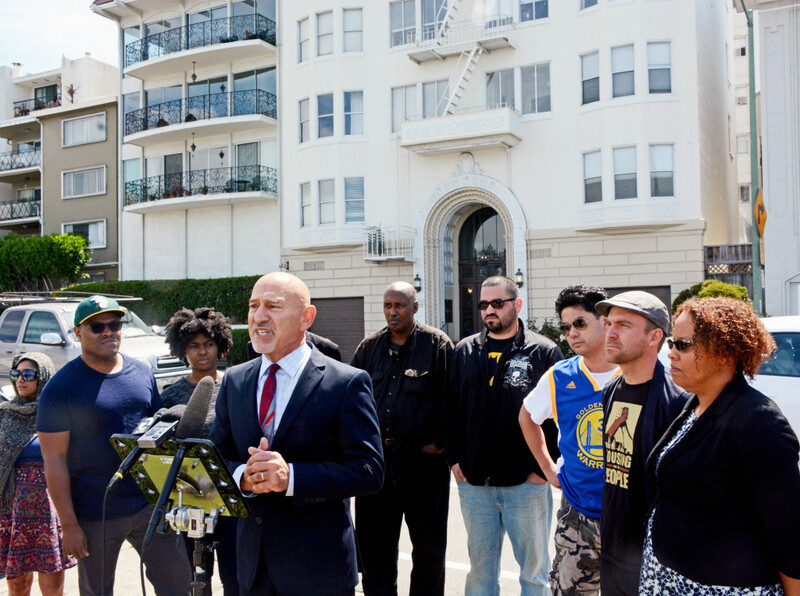 Press conference of tenants last year held to protest raising of rent of their apartments on Lakeshore. Rents went up from $1080/month to $3,870/month! the issue of affordable housing and decent jobs. It also can’t be seperated from the privatization of public spaces and of public services (such as education). To fight these issues, we have to start a working class people’s movement. An important part of that will be running our own, working class people’s candidates for public office, outside of and opposed to the Libby Schaaf’s and the Republicrat paradigm. *For those outside this area, Lake Merritt – which was the US’s first ever bird sanctuary – is a beautiful inland lagoon of brackish water and is the center piece of the park around it. The entire area around the park has become very expensive as the yuppies from San Francisco and elsewhere are settling the city. Recently one landlord raised the rents on his tenants on Lakeshore Avenue (facing the lake) from an average of $1080 per month to $3,870. Much of the ability to jack up the rents so high has been due to the $200 million renovation project of the City of Oakland. Paid for by the Oakland taxpayers, they now are paying twice as the real estate speculators and landlords are using this to jack up rents enormously. That, of course, was the entire purpose of this project – and to attract the yuppies from San Francisco and elsewhere who could afford to pay such sky-high rents.